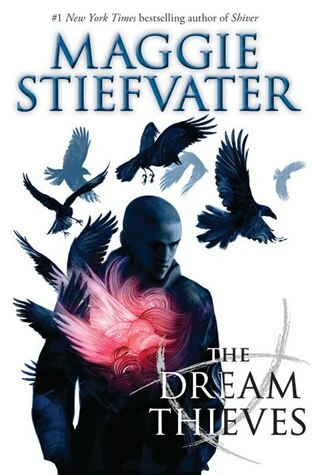 The Dream Thieves in the second book in Maggie Stiefvater's The Raven Cycle series. I adored the first book The Raven Boys. It set a very high bar for The Dream Thieves to meet. Unfortunately, for me at least, it fell short. Maggie's MO as of late is to write books which are so steeped in mystery that getting through them is like wading through molasses. Normally, the confusion is worth it because the payoff is so great. That was the case in The Raven Boys and The Scorpio Races. Eventually everything made sense and the mystery made the books even more fun. Here, I felt like there was a see-through wall separating me and the characters. I could observe what they were doing, but I couldn't reach out and connect to them emotionally. The book still focuses on all four boys (Gansey, Adam, Ronan, and Noah) plus Blue, but a large part of the focus is on Ronan and Adam. That's not inherently a bad thing. I really like Ronan. He's the stereotypical damaged bad boy that you want to love. Although he's saved from being a cliche by not being a focal-point of the romantic tension. In this book, we got a much greater idea of his supernatural abilities and his relationship with his family. I feel like I understand his character better. Adam is an increasingly disturbing character. The most pitiable of all the boys really. Ronan is hard on the outside but kind of soft on the inside. Adam is soft(ish) on the outside and hard on the inside. He is a good person, but his demons of jealousy, inferiority complex, anger, self-loathing, and more threaten to control him completely. For the most part Gansey and Blue continue to be their enjoyable selves. They develop a little bit, but they aren't the most interesting part of this book. Which depressed me, because they were the most interesting part of The Raven Boys. One thing I did like was the introduction of The Gray Man, the book's villain. The book is partially told from his perspective. A somewhat sympathetic hitman. It made me think of John Cusack's character in Gross Pointe Blank. I particularly liked his pseudo-relationship with Blue's mother. I expected to hate it. I figured it would be another stereotype of damsel in distress, kids have to go in to rescue her, but it wasn't. Blue's mother is a brilliant lady and Mr. Gray's name is very apropos. Overall, I enjoyed this book. I'd say it was very good out of context. The problem is that when I place it next to The Raven Boys, it is a pretty big disappointment. For a long time, I've said that Maggie gets better with every big. And I can't say that about this. Still, The Dream Thieves is a strong book in a wonderful series. It's well worth reading, and I hold out hope that the next book in the series will be as good as The Raven Boys. I am sorry that this book didn't work for you, Alison. I just skimmed through your review because I am still planning to read the whole series. I hope that the third book will be a better read. I love the cover though. I just couldn't get into it and that makes me sad. I really loved the first in the series and yet...*sigh* Even though it wasn't better than Raven Boys for you, at least you still really liked it!